Children's swimming-lesson plans are designed to help you teach children the basics of swimming. While swimming lesson plans give you an outline of activities and exercises you can perform with your kids, you can tailor them to your child's strengths and weaknesses. Pull your kids into the water so they get a feel for it. Depending on the child's height or skill, she may need to wear flotation devices. Alternatively, she could hold onto the pool's edge. From here, review the rules of the pool. Nobody is allowed to run or walk quickly when near the pool. While in the pool, all kids must remove all jewelry, necklaces and rings to avoid being caught in the drain of the pool. No roughhousing or diving into the pool is allowed for kids of such a young age. One parent must supervise one child at all times. Have the kids hold onto the side of the pool and kick for several minutes. Have the kids work on both their front float and back float. This lesson is designed for kids with little experience in the pool. Start your child with a combination warm-up of kicking and blowing bubbles into the water to work on proper breathing techniques. From here, have your kid perform a basic stroke while wearing flotation devices -- like water wings -- while you hold his midsection. His face should not be under water. After 10 minutes of this, roll your child over so he gets a feel for how to perform an unassisted rotation. To finish the swim plan, instruct your child to perform an unassisted backstroke. This lesson is designed to help your child swim under water to locate and retrieve objects in the pool. Before starting, have your child warm up without flotation devices by holding onto the side of the shallow end of the pool and kicking while blowing bubbles. Once your kid has warmed up, throw a series of multicolored rings into the pool. Once they hit the floor, give your kid a pair of goggles and have him dive in to get as many as he can in one breath. As he improves, throw the rings into the deeper end of the pool. This final lesson is designed to ensure your child can sufficiently swim on her own. 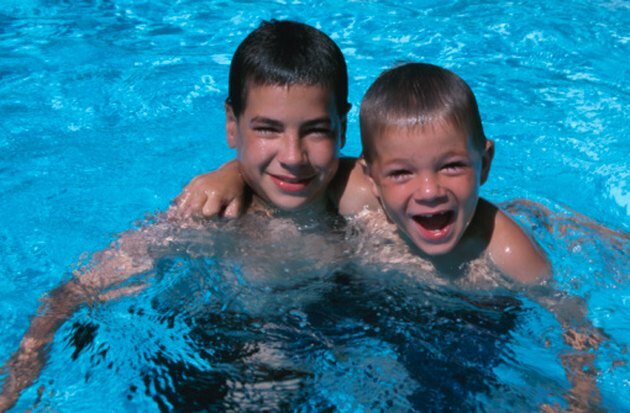 Start by having your child complete a full swimming lap without flotation devices or assistance. Once she completes this, have her perform a back float for five minutes with no assistance. From here, have your child perform a full lap using only her backstroke technique. For the final portion of the lesson, have your kid tread water for 10 minutes.